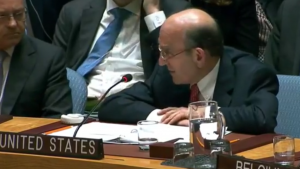 Will Elliott Abrams, “Abettor of Genocide,” do to Venezuela What he did to Guatemala? On Friday afternoon, Secretary of State Mike Pompeo named Elliott Abrams to “lead our efforts on Venezuela” as that country is threatened by civil war. On Saturday, after making remarks to the UN Security Council about Venezuela, Pompeo vacated his chair and Elliott Abrams took over as representing the U.S. government, sparring with the Russian representative and others. (Partial text; full video). Among the highlights of Abrams’ career: He was found guilty in the Iran-Contra scandal, and then got what prosecutor Lawrence Walsh called a “cover-up” pardon from George H.W. Bush. The pardon was approved by Bush’s attorney general, William Barr (who is also Trump’s current nominee for attorney general). Currently in Indonesia, Nairn is available for a limited number of interviews. He is a noted independent journalist. On an appearance with Elliott Abrams in 1995 on the program “Charlie Rose,” he accused Abrams of crimes against humanity — see video posted on Twitter on Friday which has been viewed over 400,000 times; now on YouTube with transcript. Also see interview with Nairn on the program “Intercepted” with Jeremy Scahill. Assange Arrest: “Nuclear Option” Against the First Amendment?